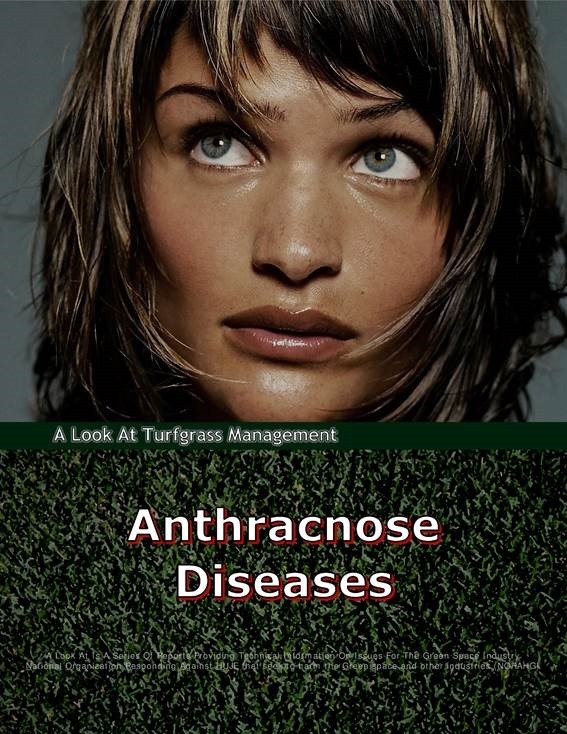 Annual Bluegrass and Creeping Bentgrass, located on golf course putting greens, tees, and fairways, are attacked by Anthracnose Diseases. The severity of Anthracnose is GREATEST when turf is subject to heavy traffic, poor soil drainage, short mowing height, and soil compaction. Anthracnose will usually appear after turf has been subject to excessive rainfall or over-irrigation. • Anthracnose Leaf ( Foliar ) Blight, which occurs primarily during the hot and dry summer months of June, July, and August, but may also develop in May and September. • Anthracnose Basal Rot or Crown Rot, which is found mostly during cool and moist conditions. Anthracnose Leaf Blight is ESPECIALLY DAMAGING TO THE LEAVES, but it may also be injurious to the ROOTS and CROWNS. During the summer months, turf may be completely burned by Anthracnose Leaf Blight within forty-eight hours after the beginning of conditions favorable to disease development. Anthracnose Basal Rot can develop throughout the entire season on Annual Bluegrass, but tends to only affect Creeping Bentgrass beginning in early summer. Anthracnose Basal Rot will be most injurious to CROWNS, STEM BASES, and STOLONS of turf growing on putting greens. Dr Bruce B Clarke has frequently spoken about GOOD CULTURAL AND BEST MANAGEMENT PRACTICES for the purposes of REDUCING FUNGICIDES used for CONTROLLING Anthracnose Diseases. 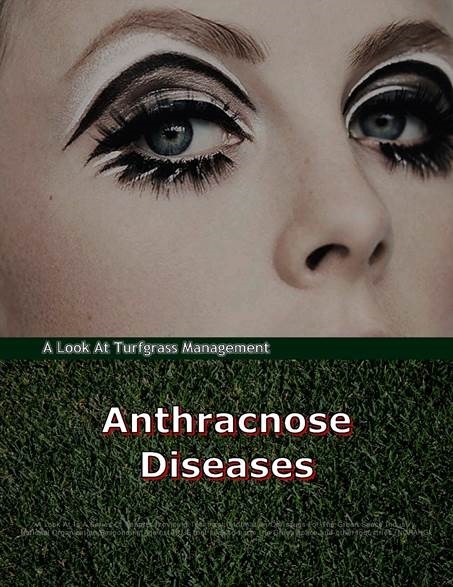 Up until about 12 years ago, little was known about the control of Anthracnose Diseases on golf course turf. Since 2002, extensive research on Anthracnose Diseases has been conducted at Rutgers University in New Jersey as well as at 11 other institutions, including the University of Guelph. Dr Clarke said so much more information about the control of Anthracnose Diseases has come about recently. Dr Clarke tells Golf Superintendents that little tweaks in their BEST MANAGEMENT PRACTICES can pay big dividends in the improved vigor, quality and performance of their turf, as well as helping to reduce their reliance on fungicides. Dr Clarke has said that BEST MANAGEMENT PRACTICES, such as fertilization, mowing, irrigation, core cultivation, and TOPDRESSING, REDUCE STRESS-RELATED DISEASES such as Anthracnose and Dollar Spot. You should be able to SIGNIFICANTLY REDUCE your fungicides either by reducing the rates or extending the intervals between applications. It is Anthracnose Basal Rot which presents the major problem, and not so much Anthracnose Leaf Blight. Once it gets into the plant’s vascular tissue, Anthracnose becomes A DISEASE THAT IS DIFFICULT TO CONTROL. 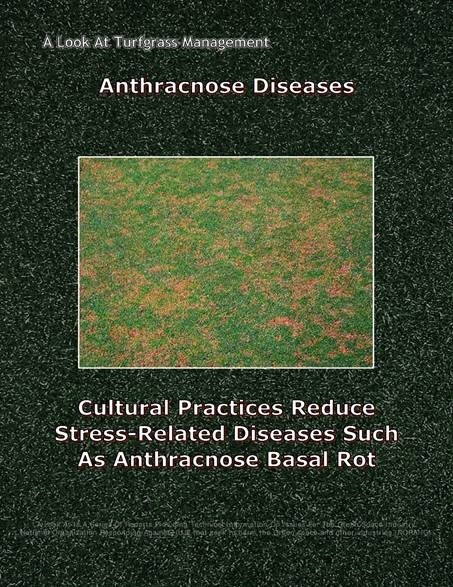 The phases of Anthracnose Disease MUST BE MANAGED FROM THE ROOTS in addition to taking it on through GOOD CULTURAL AND BEST MANAGEMENT PRACTICES. 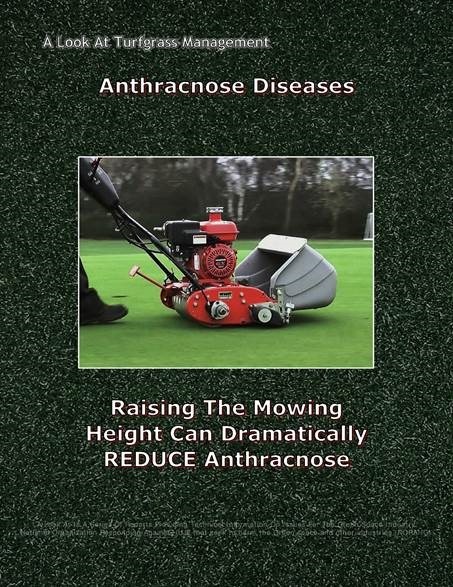 Before the Rutgers-led study was initiated, it was already known that LOWERING MOWING HEIGHTS enhanced Anthracnose. The problem, however, is that by RAISING MOWING HEIGHTS, playability and ball speed are likely to be compromised. LOWER MOWING HEIGHTS CAN STRESS TURF, especially during times of heat and drought stress, and that is when the vast majority of problems occur with Anthracnose. Dr Clarke said RAISING THE MOWING HEIGHT, even slightly, can be rewarding in terms of taking the stress off the grass and dramatically reducing Anthracnose. You CANNOT CONTROL this disease simply by RAISING THE HEIGHT OF CUT, but you can REDUCE THE SEVERITY [ of Anthracnose ] and make it easier for the fungicides to work. To MAINTAIN GOLF BALL ROLL SPEED [ on putting greens ], research has looked at such practices as ROLLING and INCREASING THE FREQUENCY OF MOWING ( i.e. SINGLE-CUTTING and DOUBLE-CUTTING ). A two-year study was conducted to compare SINGLE-CUTTING with DOUBLE-CUTTING for Anthracnose severity. When we first started this work, everybody thought that Anthracnose was a STRESS-RELATED DISEASE and a WOUND-RELATED DISEASE [ ?!?! ] , and that is 50 per cent right. Dr Clarke has said that Anthracnose is certainly A STRESS-RELATED DISEASE, noting that anything done to weaken putting greens composed of Annual Bluegrass WILL ENHANCE Anthracnose. 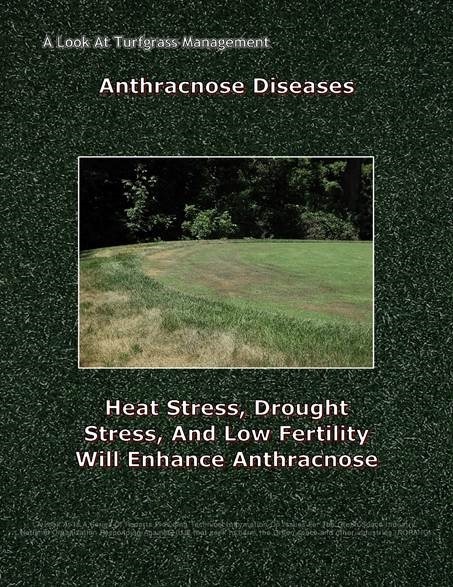 HEAT STRESS, DROUGHT STRESS, and LOW FERTILITY, are among the things which will ENHANCE Anthracnose, but it DOES NOT need an open window to get in. WOUNDING has VERY LITTLE TO DO with this disease [ Anthracnose ] , and that is an important discovery. MECHANICAL INTERVENTIONS, such as DOUBLE CUTTING, ROLLING, SAND TOPDRESSING, and DRAGGING THE SAND IN, will WOUND the plant, but will NOT increase Anthracnose, research shows. Dr Clarke has said that if a Golf Superintendent can manage his turf, and perhaps scuff it up a little bit, yet not affect Anthracnose, there is much he can do to improve the quality of his turf. Studies show there was NO DIFFERENCE in Anthracnose severity between SINGLE-CUTTING and DOUBLE-CUTTING MOWING PRACTICES. 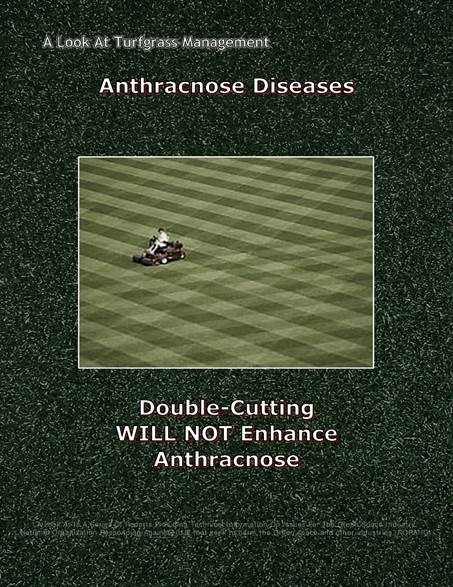 Even though you are DOUBLE-CUTTING and WOUNDING the plant twice as often, it is NOT ENHANCING ANTHRACNOSE. In the Golf Industry, SUCCESSFULLY MANAGED putting greens are often associated with GOLF BALL SPEED while ROLLING across the surface. GOLF BALL ROLL SPEED becomes INCREASED when MOWING HEIGHT IS LOWERED and when MOWING IS PERFORMED TWICE WITH EACH OPERATION ( DOUBLE-CUTTING ). LOWER MOWING HEIGHTS will provide golfers with smoother and more uniform putting green surfaces. However, LOWERING MOWING HEIGHTS to below the optimum height for a turfgrass species or variety can result in a loss of shoot density, root growth and production, decreased carbohydrate synthesis, and increased susceptibility to environmental and biotic stresses. All of which contribute to reduced turfgrass wear tolerance and disease resistance. FAST GOLF BALL ROLL SPEED alone, however, DOES NOT symbolize a good or healthy putting green. The ULTIMATE FAST GOLF BALL ROLL SPEED would require a putting green to be as hard as a rock, smooth as glass, and devoid of any turfgrass vegetation. Do golfers really want to play on this type of putting surface ?!?! Dr Clarke has said that many Golf Superintendents are reluctant to ROLL their putting greens when Anthracnose Diseases are present. 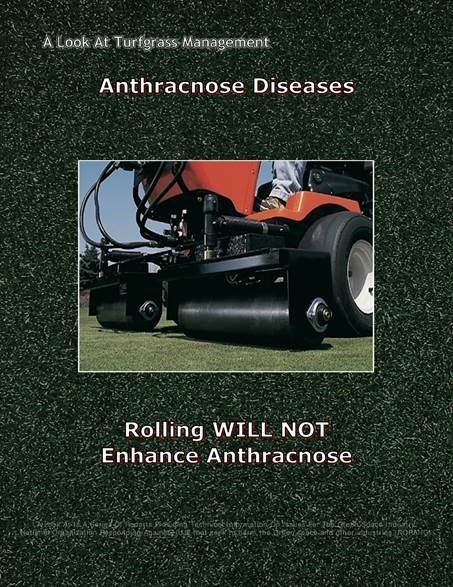 Recent studies, however, show that ROLLING every other day with either a clip-on unit, a vibratory roller or a sidewinder roller WILL NOT ENHANCE ANTHRACNOSE. We’ve never seen an ENHANCEMENT in Anthracnose with ROLLING. 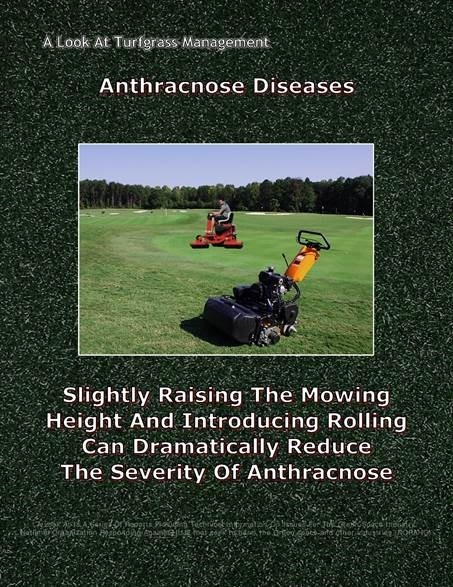 We have, under certain circumstances, seen a SLIGHT REDUCTION in Anthracnose [ because of ROLLING ]. 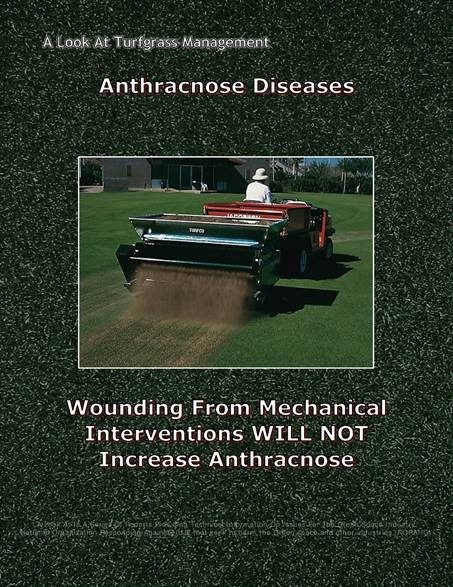 Why would ROLLING [ or smoothing ] the putting surface actually REDUCE the incidence of Anthracnose ?!?! ROLLING allows the cut height to be raised while still realizing good ball speed. Because of the INCREASED MOWING HEIGHT, stress on the plant is reduced. Studies on the effect of ROLLING on putting greens affected by Anthracnose were done with Stimpmeter readings between 9½ and 10½. During periods of heat and drought stress, SLIGHTLY RAISING THE MOWING HEIGHT and introducing ROLLING can DRAMATICALLY REDUCE THE SEVERITY of Anthracnose. We didn’t know that prior to this work. A lot of people were really afraid to go out there and ROLL a green if they had a real severe Anthracnose problem. GOOD NITROGEN FERTILITY is probably the MOST IMPORTANT PRACTICE that can be done for a putting surface in terms of Anthracnose. 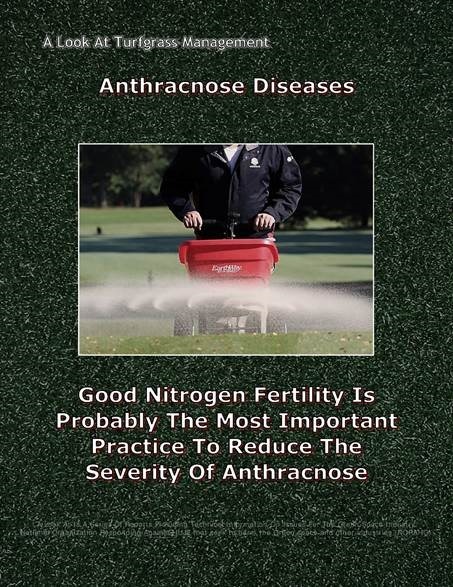 Of all the studies that have been conducted in which various GOOD CULTURAL AND BEST MANAGEMENT PRACTICES have been utilized for Anthracnose control, NITROGEN is hands down the MOST IMPORTANT of the lot. You can reduce Anthracnose probably 25 to 30 per cent without any fungicides just simply by MAINTAINING A GOOD FERTILITY PROGRAM, and in particular a GOOD NITROGEN PROGRAM. Dr Clarke has said that when Anthracnose is present on putting greens and tees, INCREASED SOLUBLE NITROGEN FERTILIZATION BY SPOON FEEDING can pay big dividends in REDUCING THE SEVERITY of Anthracnose Disease. As much as 2⁄10 of a pound of NITROGEN per 1000 square feet every two weeks, or perhaps each week, when Anthracnose is present, can allow turfgrasses to RECUPERATE from Anthracnose and SIGNIFICANTLY REDUCE ITS SEVERITY. One must be careful not to apply too much fertilizer. Studies showed that when amounts higher than 1⁄10 or 2⁄10 of a pound of SOLUBLE NITROGEN were applied every week, there can be a tipping point to where Anthracnose can become worse. It is possible to add too much SOLUBLE NITROGEN, but it is good for most programs. Increasing or SPOON-FEEDING to 1⁄10 or 2⁄10 when you have a problem can really help REDUCE THE SEVERITY [ of Anthracnose ]. What we’re trying to do is increase our SPOON-FEEDING to try to maximize the benefits of NITROGEN in IMPROVING PLANT HEALTH and REDUCING ANTHRACNOSE SEVERITY because of it. GOOD NITROGEN FERTILITY can INCREASE THE EFFECTIVENESS OF FUNGICIDES and reduce waste. Research in which sources of SOLUBLE NITROGEN, like urea, ammonium sulfate, and POTASSIUM NITRATE, were studied. POTASSIUM NITRATE was one of the better sources of SOLUBLE NITROGEN for reducing Anthracnose, prompting the question as to whether it was the NITROGEN [ nitrate ] or the POTASSIUM that was so effective. It was discovered to be the POTASSIUM. All NITROGEN sources studied reduced Anthracnose, although some were better than others. The MOST EFFECTIVE, it was discovered, was POTASSIUM NITRATE. After analyzing all of the data, it is the POTASSIUM which seemed to improve the level of control of Anthracnose. Soil pH may have had an effect, but it was NOT really pronounced. Calcium DID NOT seem to have a major effect on Anthracnose. Although various NITROGEN forms were studied, none seemed to be the effect. POTASSIUM is known to improve winter hardiness and reduce winter damage. In trials where AMMONIUM SULFATE had been applied, there was significant winter damage, but there was little where POTASSIUM NITRATE had been applied. In 2012, several sources of SOLUBLE POTASSIUM were studied, including POTASSIUM NITRATE, POTASSIUM CARBONATE, POTASSIUM SULFATE, and POTASSIUM CHLORIDE. Each was looked at in 1-to-1, 2-to-1 and 4-to-1 ratios with NITROGEN. ALL of the POTASSIUM RATIOS triggered BETTER RESULTS than NITROGEN alone or POTASSIUM alone. In the first year of the study, IT DID NOT MATTER what the source of SOLUBLE POTASSIUM was, or its ratio, only that POTASSIUM was present. Dr Clarke has said the data suggested that POTASSIUM was just as important, if not more so, than NITROGEN. So you’re marrying two important nutrients. When you put the two together, you get the least amount of disease. The 4-to-1 ratio is essentially what would be regarded as 1-to-1 or 1-to-1⅓ pounds of SOLUBLE POTASSIUM per year applied in small amounts every couple of weeks, or about 16 applications per season. There was NO real difference between 1⅓ pounds and 5⅓ pounds. As long as you were applying sufficient quantities of POTASSIUM, the plant had enough and it was REDUCING [ Anthracnose ] DISEASE. 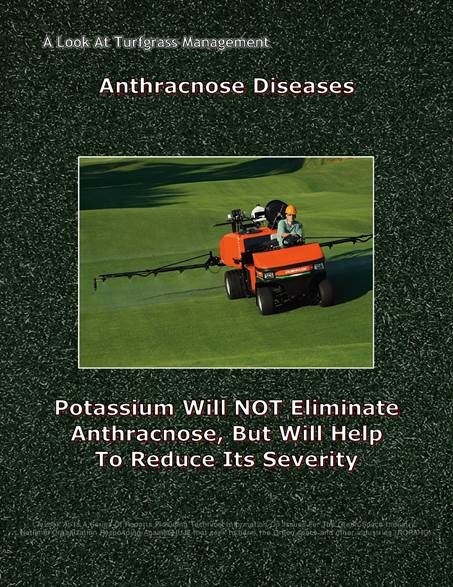 Dr Clarke has stressed that adding POTASSIUM WILL NOT ELIMINATE ANTHRACNOSE, BUT WILL HELP TO REDUCE ITS SEVERITY. Research is ongoing to study FOLIAR FEEDS OF SOLUBLE POTASSIUM for getting it into the plant quickly. TOPDRESSING is defined as the application of a thin layer of soil, or a prepared soil mixture, to a turfgrass playing surface such as a putting green. TOPDRESSING is performed in order to smooth-out and level the playing surface. TOPDRESSING may also be used to modify the soil root-zone when used in combination with core aeration. Dr Clarke has said much has been learned about Anthracnose in recent years, including THE NEED TO PRACTICE SAND TOPDRESSING. It was previously assumed that adding COARSE SAND would contribute to WOUNDING of turf [ and enhance Anthracnose ] because of sand’s abrasive qualities. [ We thought ] it was like adding fuel to the fire. We know that SAND TOPDRESSING is important agronomically. It modifies the thatch, it smooths the surface, it gives crown protection, and we now know it REDUCES ANTHRACNOSE. But we didn’t know that before we started [ the research ]. When research into TOPDRESSING was initiated, LIGHT rather than HEAVY TOPDRESSING was studied. Comparisons were made between 1 and 2 cubic feet of sand per 1,000 square feet applied every 7, 14, or 28 days. Another trial in which NO sand was used was made for comparison’s sake. It was understood that NO one would ever apply that much sand every 7 days. You’d need a snow shovel to take it off. But we wanted every possible combination to see what the effect of sand rate and sand interval of application was. Results showed that THE MOST Anthracnose was present in plots where NO sand was used. The LEAST AMOUNT of Anthracnose was present where sand was applied. The SAND TOPDRESSING study was repeated over a three-year period. It was also done by two other graduate students who repeated it for an additional two years. The results were the same in every single year. Dr Clarke has said this was done to scientifically bust the belief that TOPDRESSING would further an Anthracnose problem. 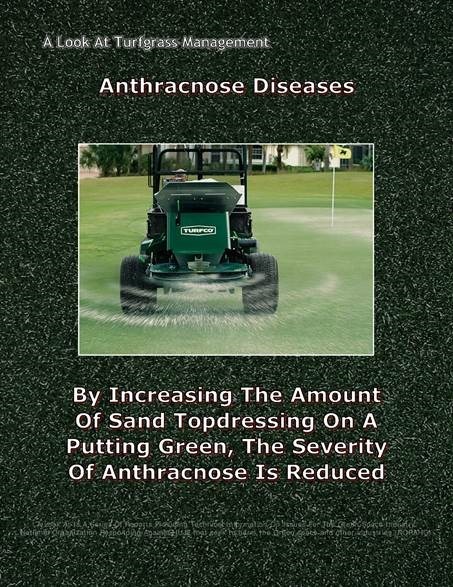 As you INCREASE THE AMOUNT OF SAND, you get LESS Anthracnose. It is completely opposite of what everyone thought they knew. It is the biggest surprise we’ve ever seen. Once believed to be a wound-related disease, Anthracnose on a putting green subjected to SAND TOPDRESSING would seemingly become worse, but IT DOES NOT. Sub-angular sand, in fact, provided BETTER SUPPRESSION of Anthracnose than round particles of sand. It provided better stability and firmed up the putting surface. Mowers will sink less into a sanded versus non-sanded putting green, allowing for a HIGHER HEIGHT OF CUT. With SAND TOPDRESSING, the turfgrass crowns will be set deeper and will be less prone to heat and drought stress, making for a more vigorous plant. With SAND TOPDRESSING, the turfgrass plants will stand more erect and will be better equipped to capture life-sustaining sunlight. Dr Clarke has said all that is required is to match turf’s growth throughout the summer with small amounts of SAND TOPDRESSING. Sand is a good thing. The quicker you can establish a full canopy, the better. Adding small amounts of SUMMER SAND TOPDRESSING to match the growth of turf is key. If turf is growing slowly, then add only a small amount of sand. If turf is growing quickly, more sand can be added. Dr Clarke also suggested SPRING SAND TOPDRESSING after core aeration, back-filling the holes, and then supplementing light amounts of sand as needed during the summer. The Golf Superintendent who optimizes the fertilization and topdressing programs can GREATLY REDUCE Anthracnose, making it easier for fungicides to be more effective. 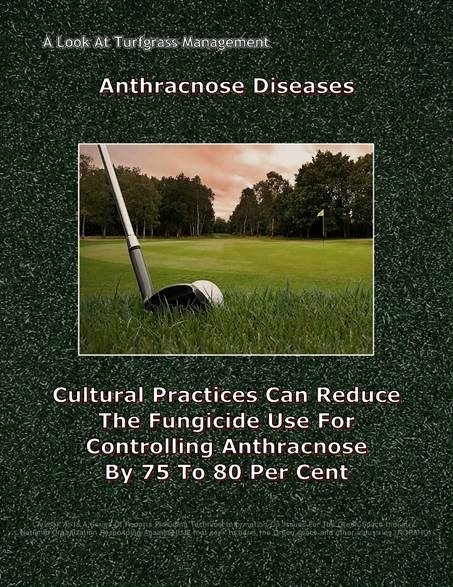 GOOD CULTURAL AND BEST MANAGEMENT PRACTICES CAN REDUCE THE FUNGICIDE USE FOR CONTROLLING ANTHRACNOSE BY 75 TO 80 PER CENT. Putting greens that are maintained too wet will see more Anthracnose. The trend is to run putting greens dry, but, if they become too dry, Anthracnose can be enhanced. Putting greens must be dry, but not too dry. You run them [ the putting greens ] too dry, the plants are always wilting, and it will predispose the plants to [ Anthracnose ] infection. MECHANICAL INTERVENTIONS, such as VERTI-CUTTING and LIGHT GROOMING, will WOUND the plant, but will NOT increase Anthracnose. Additionally, Plant Growth Regulators such as Primo began will NOT increase Anthracnose. 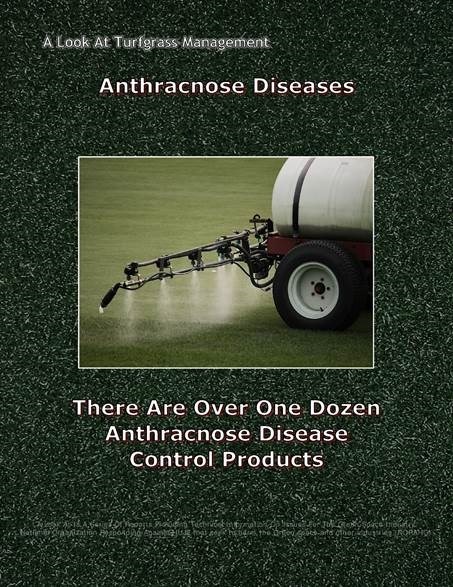 There are currently over one dozen Anthracnose Disease Control Products in Canada that will work against Anthracnose. Apply when WARM HUMID WEATHER CONDITIONS OCCUR. Do not apply more than 3 times a season. Apply 2 to 4 applications 14 days apart as a PREVENTIVE treatment in spring or summer to areas with a history. Begin when CONDITIONS FAVOUR DISEASE DEVELOPMENT. Should be used with a fertility program that avoids excess, yet provides adequate nitrogen through light, more frequent applications over the entire growing season. Under extreme prolonged infection pressure, should be used as a part of a season-long spray program with other fungicides. Apply at the first signs or when CONDITIONS FAVOUR DISEASE DEVELOPMENT. Under low disease conditions, the spray interval may be increased up to 21-days. Do not apply more than 3 times per season. Apply as required but not less than 14 days between treatments. Use shorter spray interval under high disease pressure. Apply when CONDITIONS ARE FAVOURABLE FOR DISEASE DEVELOPMENT. Rotate with different mode-of-action fungicides. Do not use more than 2 sequential applications. Do not apply more than 2.4 kilograms per hectare per year. Apply when CONDITIONS FAVOUR DISEASE DEVELOPMENT, but before symptoms develop, and repeat applications as long as conditions persist. Begin applications WHEN CONDITIONS FAVOUR INFECTION, and before symptoms develop. Apply at the first signs or WHEN ENVIRONMENTAL CONDITIONS ( cool and wet conditions or hot and humid conditions ) FAVOUR DISEASE DEVELOPMENT. Use the higher rate and shorter interval when pressure is high. Under low disease conditions, the spray interval may be increased up to 21 days. Apply when CONDITIONS FAVOUR DISEASE DEVELOPMENT. Apply ON A PREVENTATIVE BASIS or when DISEASE SYMPTOMS FIRST APPEAR. When environmental conditions and plant stage are conducive to rapid disease development, use Regalia Maxx in a rotational program with other registered fungicides. Continue applications as needed on 7 to 10-day intervals. Apply in enough water to provide thorough coverage. Under moderate-to-severe disease pressure, use higher rates and minimum spray intervals, and use in a program with other registered fungicides. Use ON A PREVENTATIVE BASIS when CONDITIONS FAVOUR DISEASE DEVELOPMENT. Apply in 8 litres of water per 100 square metres for LEAF ( FOLIAR ) BLIGHT. Apply 8 to 16 litres of water per 100 square metres for BASAL ROT. Apply at the first sign of Anthracnose break-out or apply ON A PREVENTATIVE BASIS when stressful environmental conditions ( cool and wet conditions or hot and humid conditions ) favour Anthracnose development. Maximum of 2 applications during ANTHRACNOSE BASAL ROT infection period. Every application must be alternated with at least one application of a non-strobilurin fungicide. Begin application AT THE EARLY STAGE OF DISEASE DEVELOPMENT. Use high rates for high disease pressure. May be applied as a tank-mix with other fungicides registered for the same disease such as Daconil Ultrex and Heritage fungicides. Spray diluted solution to achieve full and even coverage. Up to 5 consecutive applications may be used with a minimum 7-day spray interval between applications.